The August Bird Notes in the Arran Banner in 2014 finished with "September sees the start of the peak migration season when many birds are on the move. It is the time to expect the unexpected. I look forward to hearing from you." I did not expect to get an email about a Gyrfalcon on Arran but on 8 September that is what I received. 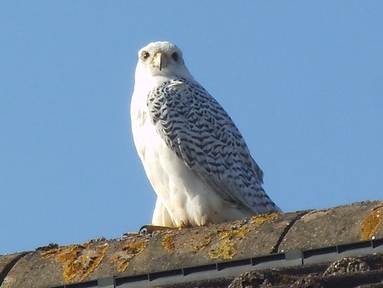 Gyrfalcon breed on Arctic coasts and the islands of North America, Europe, and Asia. It is the largest of the falcon species with a wingspan of over 130cm compared to about 100cm for a large female Peregrine. Female Gyrfalcons are bigger than the males and can weigh in at over 4.5lbs. These birds are longer and have a bigger wingspan than Buzzards. In the wild they are formidable hunters. This bird was a falconer's bird that had escaped. 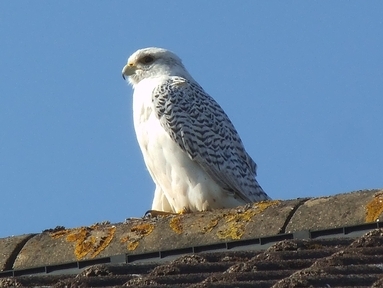 On the evening of 9 September there was a phone call to me reporting a Gyrfalcon in Sliddery. The attached photographs of this stunning bird were taken there. The falconer was phoned but did not manage to make contact with the bird. On the morning of 12 September there was a second phone call to me. This time the bird was in Dougarie by the bridge and boat house. This time the falconer was able to make contact with the bird. When he appeared, the bird went and sat on a post and when the falconer produced food, the bird came and took it from his hand. It was probably hungry after five days on the loose, but the island birding contacts and the skill of the falconer ensured the safe return of the bird.